Photo: Palestinian students detained at staircase leading to Shuhada Street, when leaving Qurtuba school, on Monday. 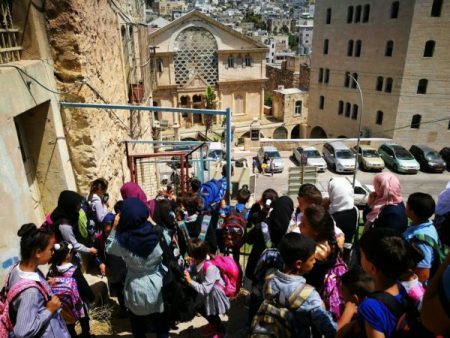 Israeli forces in occupied al-Khalil (Hebron) are severely restricting, for the second day in a row, the freedom of movement for Palestinian students and teachers at Qurtuba school. Whereas, on Monday, students and teachers were detained by Israeli forces for almost half an hour before being allowed to continue on their way home after the school day, the following day Israeli forces prevented the students from bringing essential school materials and denying them, again, to pass the checkpoint. Qurtuba school is located in the H2-area of occupied al-Khalil, under full Israeli military control. In order to reach Qurtuba school, all students and teachers are forced to pass at least one, sometimes two, or even three Israeli military checkpoints within Palestinian neighborhoods. The majority of the students and teachers accesses the school through a set of stairs at Daboya checkpoint. This checkpoint marks for Palestinians the spot where Shuhada Street has been ethnically cleansed of Palestinians, an undergoing policy which continuously forbids them from this point further down the road – the part of Shuhada Street where the illegal Israeli settlements in the heart of the city are located. At Daboya checkpoint, thus, the only possible direction for Palestinians is to go up the stairs, which lead to Qurtuba school. At the end of 2015, though, right after the whole area of Tel Rumeida, including Shuhada Street, was declared a ‘closed military zone’ by the Israelis, limiting the access to registered (that is, numbered Palestinians), the access to the staircase has been closed for use by Palestinians, whereas settlers are free to use the stairs as they please. The only exception to this closure is Qurtuba school’s students and teachers twice a day: in the morning, at the start of the school day, and in the afternoon once school finishes – at least, in theory. Several times students and teachers have been denied passage or detained for hours, at this spot. This setting alone creates an atmosphere not especially conducive to learning, with the constant uncertainty of what will happen: whether you will be checked, searched, detained or arrested at a checkpoint on the way to school or home, whether your teachers will get to school or settlers might attack you on the way or inside the school, in what becomes a vital part of the (psychological) occupation of the Palestinian civilians living in this area. 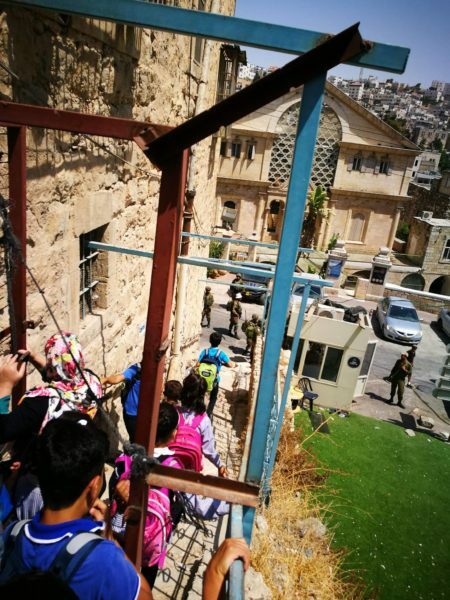 On Monday, 28th August, the students were detained with their teachers after the end of the school day, waiting at the top of the staircase for the soldiers to finally decide to allow them to reach their homes. On Tuesday, when students wanted to bring school books, they were again detained by the soldiers at the top of the stairs, while down on Shuhada Street, infamous and aggressive settlers Anat Cohen and Ofer Yohana gathered to watch the show of power by the Israeli forces. Eventually, the soldiers denied children the possibility of carrying their school materials altogether, and the children went back to their classes without books. These actions constitute severe infringements on the Palestinian students basic human right to education, and are deliberate attempts at the quiet transfer of the Palestinian community from the whole area. Israeli forces are creating a coercive environment in order to leave no other option for Palestinians to leave the area and, thus, create an already connected area of illegal settlements – free of any Palestinian presence.